Almost thirty years later, Stacy and Stephanie are two of only a handful of kids from my elementary-school days whose names I remember. I wish I could say it was with fondness, but I can’t. You see, these two seatmates were my first encounter with mean girls. One website defines them as girls who exhibit “relational aggression” such as “gossip, verbal put downs of others, bullying, backstabbing, and using others to get ahead.” Back in my yellow bus-riding days, meanness took the form of passive aggressive put downs, subtle insults disguised as discussion and critique. Fast forward to my late thirties and I’m now the mom of four daughters. 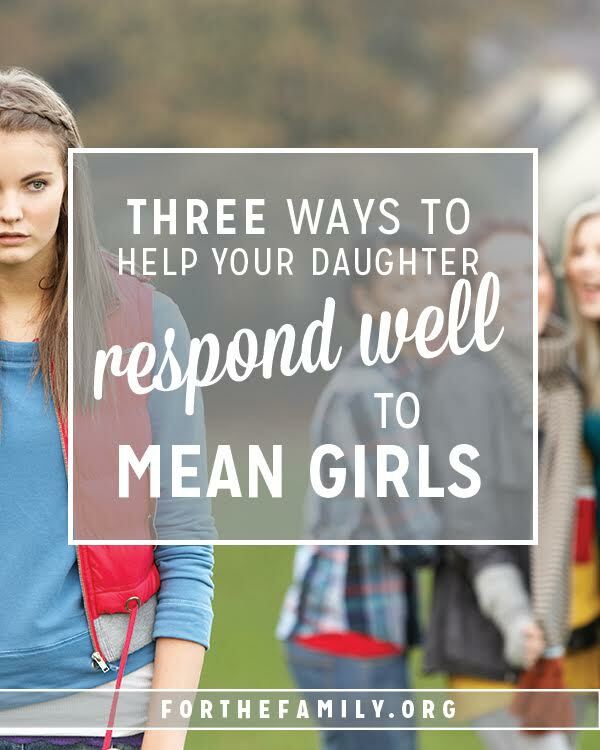 In the last two years, each of them, from my five-year-old to my twelve-year-old, have had at least one encounter with a mean girl. How do I help them respond well when they face gossip, verbal put downs, or bullying? Here are three things I teach them. I strive to teach my daughters that the same is true for girls who are unkind to them. Just because a belittling comment or a look that signifies disgust is directed toward them doesn’t make it accurate. It doesn’t reflect their true worth or value. Rather, as Luke 6:45 speaks of, it reveals what’s in the heart of the other person. Often, it points to insecurity and a need to make oneself feel better by degrading another. When Jesus spoke of enemies, the term “frenemies” wasn’t yet in use. That doesn’t mean that his words don’t apply to those girls who are nice one moment and mean the next. In Matthew 5:44, Jesus encouraged all who listened to love their enemies and pray for anyone who persecuted them. I invite my girls to do the same when they encounter mean girls. It isn’t easy to react with kindness, I advise them, but it’s the best response. Just to clarify, this doesn’t mean I advise my daughters to purposely spend time with girls who are consistently unkind to them. I don’t. However, if they have no choice but to be around them, whether in a class or even at church, I teach them to do their best to extend good will.